Which Muscles Do I Use for Running? Should I Wear Ankle and Wrist Weights to Build More Muscle and Burn More Calories When I Run? Will Running Get Rid of Cellulite? How Much Running Should I Do? Should I Run in Road Races as a Beginner? "Baby, we were born to run." Those immortal words by Bruce Springsteen may be more than just rock and roll lyrics, they may explain our evolutionary past. In this article, I'll describe the biological and social history of running, the health and fitness benefits (and risks) of running, how to get started, how to run properly, and some training techniques. The conventional thinking among most scholars is that early man (hunter-gatherers) ran in short sprints as a matter of survival - to catch prey and escape danger - but that running, and particularly endurance running, was merely a byproduct of the ability to walk and not a natural part of our evolution. The argument goes that (1) running is less efficient than walking (you burn more calories doing it), and (2) humans are poor sprinters compared to four-legged animals (who run much faster), and so it is concluded that we were never designed, or "born" to run. In evolutionary terms, scientists would say that we were not adapted for running. But University of Utah biologist Dennis Bramble and Harvard University anthropologist Daniel Lieberman suggest otherwise. In their research, published in the prestigious journal Nature, they claim that the "roots of running may be as ancient as the origin of the human genus, and its demands a major contributing factor to the human body form." In other words, the act of running helped shaped the way we look. a strong prominent buttocks that propel and stabilize the body during running. Based on the evidence, they claim, "Running has substantially shaped human evolution. Running made us human -- at least in an anatomical sense. We think running is one of the most transforming events in human history. We are arguing the emergence of humans is tied to the evolution of running." If Bramble and Lieberman are right, then indeed the lyrics are true -- "Baby, we were born to run!" Moving forward through the millennia to the ancient Olympic Games (776 B.C.) in Olympia, Greece, you find what could be the first documented competitive running event. It is reported that Koroibos, a cook from the city of Elis, won a 600-foot-long road race in those Olympics. But it was the ancient Greek messenger Pheidippides who set the stage for running in the modern era. In 490 B.C., Pheidippides ran 26 miles from the town of Marathon to Athens to announce the Greek victory over Persia in the Battle of Marathon. It was this event that inspired the running of the marathon (26.2 miles) in the first modern Olympic Games in Athens, Greece, in 1896, but organized running in the modern era had its roots earlier than that. The first collegiate races were sponsored by the Intercollegiate Association of Amateur Athletes of America in 1873, and in 1888, the Amateur Athletic Union held its first championships. It was in the 20th century that the scope of organized and recreational running widened. The first NCAA national championships were held for men in 1921, and women's track and field became a part of the Olympic Games in 1928. Today, the International Association of Athletics Federations (IAAF) governs the sport internationally and includes more than 200 member nations. In the United States and Canada, track and field is one of the most popular high school sports. Recreationally, it is estimated that over 15 million Americans jog or run for fitness and health. In 2007, more than 20,000 runners completed the 111th Boston Marathon (the world's oldest marathon), and more than 39,000 participated in the New York City Marathon (the world's largest marathon -- and more than 90,000 applied to participate!). What do 15 million Americans know and love about running that you don't? Let's have a look. The Merriam-Webster dictionary defines running as "to go faster than a walk; specifically: to go steadily by springing steps so that both feet leave the ground for an instant." The key is that both feet are in the air at the same time. By comparison, one foot is always in contact with the ground when you walk. Running is less efficient than walking, as mentioned earlier, precisely because you must propel your body weight through the air. The movement is similar; running is just faster. reduce the risk of dementia. Running uses the muscles in the thighs (quadriceps), the backs of the legs (hamstrings), calves, hips, low back, and buttocks, and the upper body cannot be ignored since you use your torso (back and abdominal muscles) as well as your arms and shoulders to help you stabilize, balance, and move forward. Here are a few tips for running-based muscle building. Run up and down hills to focus on tightening and toning your thighs and buttocks. Doing speed work or intervals (where you sprint for a few minutes at high speeds and then recover at a slower pace) is comparable to leg exercises in the gym (leg press, leg extension, etc. ), so you can skip your leg work on the days that you do these workouts. Run backward if you want to work your ankles, lower back, and thighs (hamstrings and quadriceps) and improve your balance. Research shows that the use of extra weight on the arms or legs while walking (no studies on running could be located) can add to the calorie expenditure. In one study of walking with walking sticks, calorie expenditure increased by an average of 23% compared to walking without the sticks. In a similar study where subjects walked on a treadmill with arm levers, calorie expenditure increased by 55% above walking without the levers. However, the extra weight has the potential to throw off your natural gait, particularly during running where the forces are magnified, and theoretically could increase the risk of injury to the joints, or at the very least cause neck and shoulder strain. As for ankle weights, the same risk of throwing off the gait applies. If the legs are carrying extra weight at the ankles, then the stress could transfer to the knees and lower back as the weight pulls on these joints. My suggestion is that if you want to carry extra weight to burn more calories, you should wear a weight vest. The vest will cause the extra weight to be distributed evenly on the torso and supported at your hips, thereby causing your legs, and not your lower back, neck, or other vulnerable joints to do most of the extra work. Below are a couple of training plans designed to get you up to 30 minutes of jogging or running. You can use them as a base and make modifications as you go along. Here's a nine-week, four-day a week plan to get you to 30 minutes of jogging/running. It's called out and back, and just like it sounds, you go out for the time prescribed, turn around, and head back to the start. Here's a 10-week three-day a week plan to get you to 30 minutes of jogging/running. Individuals don't typically lose lots of weight with exercise. The reason is that running and any other aerobic exercises simply don't burn that many calories. Exercise is the single best predictor of maintenance of weight loss once you lose it (you won't keep the weight off without exercise), but to effectively lose weight, you need to reduce your calorie intake to the point where you burn more than you consume. We've all been there - you burn 450 calories in your 40-minute workout at the gym, but you overconsume calories afterward. Just one 6-ounce bagel has 480 calories all by itself! Think how quickly you can put back all those calories. But not all the news about running and weight loss is bad. It's important to know that (1) you still do burn calories when you run (a 150-pound person burns approximately 100 calories per mile), and so it will contribute to weight loss if you don't compensate for it by consuming extra calories, and (2) there is an interaction between exercise and how many calories you consume. By interaction, I mean that exercise can have an effect on your appetite and your satiety (how full you feel). Running reduces appetite for some people, while others figure that they've just done all that exercise so why spoil it by overconsuming? But if running does make you hungry, then I suggest the following tips to gain back control. Have a snack 30-45 minutes pre-workout if you last ate more than three to four hours before your run, because you're probably just plain hungry. Good choices are half a bagel with peanut butter, a banana, or an energy bar with carbs and protein. Drink water before you reach for food; sometimes individuals eat when all they are is thirsty. Gauge the intensity of your workout, because intense workouts can make you hungry. You don't need to cut back on your workout if you're starving afterward, just make sure to have a snack 30-60 minutes before the workout. Avoid sweetened beverages and sports drinks unless you do aerobic exercise for more than one hour. Juice, Gatorade, and other sports drinks do have calories, and these can add up. Go ahead and run and see if your cellulite decreases (most of the time running has some effect), but be patient and try not to be too hard on yourself if you don't get the result you desire). Remember that it's genetic and you may not have control over it. Plus running offers so many other benefits that it would be a shame to let cellulite distract you from experiencing them. You have joint pain, arthritis (particularly in the knees), or other conditions that might be worsened by pounding (disc problems in the lower back, sciatica). Speak with your doctor before you start running if you have any of these conditions. You are overweight. There is no guideline for when to start running if you are overweight, and so you should use common sense and listen to your body. If running feels hard on your joints, particularly on your knees, then you should consider losing some weight before you start. For men and women considering more ambitious training, research suggests that running more than 40 miles per week is a risk factor for injury in both genders, particularly in the knee. The risk seems to be higher for men, perhaps because men are heavier. To reduce ground-impact forces, avoid concrete and run instead on soft, flat ground like a cinder track, boardwalk, grass (watch for holes), or a dirt path. Treadmills are softer than the road, and so if you have an opportunity to use one, you might want to take advantage of that. No one has a crystal ball when it comes to predicting who will or will not develop knee problems, so again, practice common sense and listen to your body. Don't do it if it hurts, never run through pain, and see your doctor when you do have pain that lasts for more than a few days. Relax your upper body and allow your arms to swing naturally. Keep your torso and shoulders relaxed. Keep you torso upright and hips slightly forward. Keep your elbows bent at 90 degrees. Keep your hands relaxed; they should almost flop at the wrist. The tension in your hands should be light, like you are holding a small bird. Breathe naturally in and out through your nose and mouth (ignore advice that says to breathe only though your nose). If you are a shallow breather (you take rapid, short breaths) and find you get out of breath quickly no matter what your speed, try exhaling fully; that will cause you to slow down your breathing and inhale more deeply. Running shoes are designed to match your foot type and your foot strike (how your foot hits the ground). There are three foot types. Pronation. You pronate if you have flat feet or your arch collapses when you run and your ankle turns in. Pronation can lead to ankle sprains, stress fractures, and shin splints. You probably pronate if the inner edge of your shoe is worn down. Supination. You supinate if you have stiff, high arches that don't flatten. Supinators absorb less shock on foot strike, which can lead to plantar fasciitis, Achilles tendonitis, ankle sprains, and iliotibial band syndrome. You probably supinate if the outer edge of your shoe is worn down. Neutral position. This means that you have a neutral foot strike and your foot doesn't roll one way or the other very much. Your shoe will wear down in the middle of the back of the heel. Pronators should wear shoes with firm mid-soles to support the arch and provide motion control (overly soft shoes without support won't work); supinators should wear shoes with lots of cushion to help absorb the shock (with less motion-control than pronators since too much control reduces shock absorption); and neutral foot strikers can wear pretty much any shoe that feels comfortable. I also recommend purchasing a full-length insole to replace the paper-thin insole that comes with most running shoes. These will add cushion and support without changing your biomechanics (your natural running style). PowerFeet and Spenco are two companies that make these insoles. Once you've determined your foot and shoe type, it's time to try them on. Here are some tips. Wear the socks you run in. Shop at the end of the day when your feet are swollen. Take the shoes out for a spin. A reputable running shoe store will let you run outside, or they may even have a treadmill. There should be wiggle room in the toe, and your heel should not rise more than ¼ of an inch. Be leery of too much break-in time. A certain amount of softening and conforming of the shoe to your foot should be expected, but shoes should feel reasonably comfortable from the start. I recommend clothing made of synthetic fabrics like polypropylene (polypro) that wick away moisture and keep you dry. Cotton gets wet and stays wet, which makes it clammy in cold weather and sticky when it's warm. Polypro doesn't have that problem; it performs well in both cold and warm weather. Cotton will work just fine if you're just getting started, and then you can always get more high tech if you decide that you're going to keep on running. Shirt. Any old T-shirt will do when you're just getting started. As you get more serious, you can start with polypro fabrics and singlets (the sleeveless tops that many runners wear). Shorts. Running shorts are typically made of some type of synthetic material, come in slightly different lengths, and some have minor accessories like an internal pocket for cash and keys. Some people like to run in Lycra bike shorts. Bike shorts are comfortable for some, and they eliminate chafing in the thighs for runners whose thighs rub together. Leggings. Once it gets cold, you can wear leggings (Lycra or polypro). These fit loose, tight, or somewhere in between. Try them on and see what feels most comfortable to you. Inclement weather. For the rain or particularly cold weather, wear an outer shell. Inexpensive shells are made of nylon and will keep you warm and dry for short runs, but they don't breathe, and so if you're out there for more than 20-30 minutes, you're going to feel clammy (even if your shirt is polypro). I recommend investing in a quality shell made of Gore-Tex or other breathable fabric if you intend to run in cooler weather or the rain. The high-tech shells will keep you warm and dry by letting moisture escape but keeping out the wind and rain. They also have vents to help you regulate your temperature. Socks. I recommend running or hiking socks. They have reinforced and padded heels, and they are synthetic, which means they dry quickly and slide easily over your skin when wet (which reduces the risk of friction blisters). Cotton socks don't dry quickly and get abrasive when they get wet, which increases the risk of blisters. Hat. Any type of polypro hat will do as long as it isn't too thick and wicks the sweat away from you. My favorite hat for all outdoor cold-weather activities is made of Thermax. It's ultra-thin (even fits under a bike helmet), comfortable, and wicks away the sweat. It keeps me warm no matter how cold or sweaty I get. The guidelines for fitness and health in the United States are to either accumulate 30 minutes or more of moderate intensity physical activity on most, preferably all, days of the week (you can accumulate it in bouts of 10-15 minutes), or do more vigorous-intensity aerobic physical activity (like running) for a minimum of 20 minutes on three days each week. Running fits into either guideline and will help you improve your health and fitness. I recommend no more than 10 minutes of running/jogging to start (less if you can't make 10 minutes), and then monitor how you feel the next day. You can expect to be a little sore in your legs (which can get worse on day two), but if there is pain that immobilizes you, then you know that you did too much. Pace yourself. Don't go out too fast and get out of breath in the first few minutes. Instead, warm up with a slow jog and then increase your speed. Stretch before and after your run to loosen up your muscles. Although there isn't a lot of research to substantiate it, the conventional advice for increasing is not to increase by more than 10% of your distance or time each week. That means just one minute if you've been doing 10 minutes. I believe the 10% advice is a bit conservative for shorter durations. For instance, let's say you've been jogging or running for 10 minutes for a couple of weeks and you're feeling comfortable with your breathing, your pace, and in your joints and muscles. In that case, I believe you can increase by two, three, four, or even five minutes if you like (as long as it is comfortable), whereas if you're running or jogging for 30 minutes, then a 50% increase (from 30 to 45 minutes) might be too much. The important point is to listen to your body and not push to the point of pain, and to stop running if you do have pain. Setting a goal to participate in a road race is an excellent idea. You're only competing against yourself, and they provide great motivation to help you stay focused on your training. You also get to meet lots of people who share a similar interest, have some fun, and collect a really cool T-shirt as a souvenir for participating! Racing also helps get otherwise sedentary couch potatoes outside on the weekend instead of sitting in front of the TV watching the ball game and eating. You can start with a one-mile fun run to get your feet (or running shoes as it may be) wet, and if you're more ambitious, then consider registering for a 5K race (3.2 miles). Many cities have local running clubs that sponsor races and offer training clinics for novices (also see the training plans below). Search online for running clubs in your location. Racing is a great way to go for novices and more experienced runners alike. Beginners (and occasionally more experienced runners) do make mistakes. One of the classics is to overtrain -- that is, running too far, too fast, or too frequently, and ending up with overtraining syndrome. Symptoms of overtraining are loss of strength, speed, endurance, or other elements of performance, loss of appetite, inability to sleep well, chronic aches and pains or soreness, chronic colds or respiratory infections, overuse injuries like tendinitis, unusual fatigue, occasional increase in resting heart rate, irritability, or you just don't feel like exercising anymore. You should take a break if you have any of these symptoms and they are from overtraining. Seven to 10 days off may be all you need, and in virtually every case, runners who take a break come back stronger. To prevent overtraining syndrome, monitor your body and take breaks when you are tired. Your body needs time for rest, recovery, and growth after a workout, and so if you never take a break, there's no time for your muscles to get stronger. If your feet or joints or muscles start to hurt and medical problems can be ruled out, then it's definitely time to look at new shoes. If the sole of your shoe is worn out, it's time to invest in new shoes. If you're middle-aged and still running in the sneakers you used in high school, then it's time for a change. The best way to know if you need new shoes is to take them with you to the running shoe store and compare how they feel to a brand-new pair. If the new shoes feel more supportive or stable, then you know you need new ones. Yet another mistake is shallow breathing. Shallow breathing is when the air you breathe doesn't saturate deep into the lungs and leaves you short of breath. Some people know shallow breathing as hyperventilating. It can be caused by anxiety, poor running form (leaning excessively forward), or going out too fast. If you find yourself short of breath when running, then slow down and take long exhalations. These will help you take in longer inhalations. Interval training is a method of training where you alternate between high and low intensities during your workout with the objective of increasing your stamina. 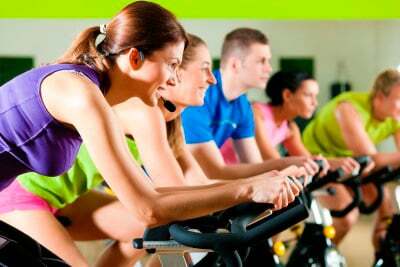 Research shows that it is an extremely effective method for improving fitness. You set up intervals by using "work to active-recovery" ratios (expressed as work:active-recovery), where work is the faster speed and active-recovery is the slower. The mechanics of it are to simultaneously and progressively over time increase the time at the work interval and decrease the time at the active-recovery. Here's a simple example assuming you can jog or run for 30 minutes at 6 miles per hour (mph). Jog for five minutes at 6 mph to warm up. Increase the speed to 6.3 mph and jog for one minute. Jog for three minutes at 6 mph. Repeat these intervals for your entire workout. In this example, the work:active-recovery ratio is 1:3. The idea is to increase the work part to one and a half minutes and decrease the active-recovery to two and a half, and then continue to increase and decrease in 30-second increments (weekly if possible) until you are running at 6.3 mph for the entire workout. You can also get more specific and use heart rate to set up your intervals. For example, say your heart rate is 70% of your predicted maximum when you run at 6 mph, and it's 85% of your max when you run at 6.5 mph. What you do then is set up your ratio of 1:3 based on your training zone by running at 6.5 mph (85%) for one minute and then 6 mph (70%) for three minutes. As you continue to decrease the active-recovery interval and increase the work interval, your conditioning will improve, and then after a couple of months you should be running your entire workout at 6.5 mph. In addition to Pheidippides, below is just a brief list of some of the most influential runners of all time. Dr. Sheehan is my running hero. He was a cardiologist, who, in the 1970s, at the age of 45, decided to turn his health and his life around. He caught the running bug and started to train, compete, and run marathons. He quickly became an expert on the subject and started writing weekly fitness columns in local newspapers. He was medical editor for Runner's World magazine for 25 years, he counseled his patients on the virtues of exercise, and he lectured internationally. He wrote eight books about running and fitness and health, and he played a key role in promoting the running boom of the '70s. He was philosophical about winning, losing, suffering, meditation, training, and working through pain, and he would quote the likes of William James for inspiration. Running & Being was his classic book. He wrote it more than 25 years ago and it still sells internationally. In 1986, Dr. Sheehan was diagnosed with prostate cancer. Unfortunately, the cancer had spread to his bones by the time he was diagnosed. He hung on courageously for seven more years, running and competing up until the end of his life. He died four days short of his 75th birthday on Nov. 1, 1993. Dr. Sheehan had a zest for life. Benoit-Samuelson is one of the pioneers of women's running. She is the American record holder for the marathon and half marathon, and she's the only American woman to win the gold medal in the Olympics for the marathon. In 1985, she won the James E. Sullivan Award as the top amateur athlete in the United States, and according to Runner's World magazine, Benoit-Samuelson is the greatest American marathoner in history. Grete Waitz is another pioneer of women's running. She won nine New York City Marathons, the silver medal at the 1984 Summer Olympics in Los Angeles, and a gold medal at the 1983 World Championships. In her home country of Norway, she is a legend. There's an annual race named after her and a statue of her outside the Bislett Stadium in Oslo. She has also been featured on a set of stamps. "Pre," as he was known, is regarded by many authorities as the best middle-long distance runner in the history of the United States. Unfortunately, he was tragically killed in a car accident in 1975 at the age of 25, but during his brief career, he held every American running record from 2,000 meters to 10,000 meters. He was favored to win the 5,000-meter run at the 1976 Montreal Olympics before his death. He was well-known for his courage, charisma, determination, and his love of running. Be sure to check out the movies about his life: Prefontaine and Without Limits. The first man to break the four-minute mile, he ran 3:59.4 on May 6, 1954, at a meet in Oxford, England. You can read about it in the book The Four-Minute Mile by Roger Bannister. Rodgers was a great personality for running during his career. He won both the Boston Marathon and the New York City Marathon four times each, breaking the record twice at Boston with a time of 2:09:55 in 1975 and a 2:09:27 in 1979 (28 of the 59 marathons he ran in his career were run under 2:15). In 1978, he won 27 of the 30 races he entered, including the Pepsi 10,000-meter nationals with a new world record (28:36.3). Track & Field News ranked Rodgers number one in the world in the marathon in 1975, 1977, and 1979 (he won 22 marathons in his career). He is in the National Track & Field Hall of Fame in Indianapolis, Indiana, and the National Distance Running Hall of Fame in Utica, New York. Shorter's list of victories is not short! He won the 1969 NCAA 10,000-meter, 5,000-meter and 10,000-meter national titles in 1970 and was U.S. national champion in the 10,000 meters in 1971, 1974, 1975, and 1977. He won the U.S. national cross-country championships four times (1970-1973), the U.S. Olympic Trials Champion in both the 10,000 meter and the marathon in 1972 and 1976, and the 10,000 meter and the marathon at the 1971 Pan American Games. He was a four-time winner of the Fukuoka Marathon (1971-1974) and also won the Peachtree Road Race in 1977 and the Falmouth Road Race in 1975 and 1976. His greatest achievement though is winning the gold medal in the marathon at the 1972 Olympics. He was inducted into the U.S. Olympic Hall of Fame in 1984, the National Track and Field Hall of Fame in 1989, and the National Distance Running Hall of Fame in 1998. Keino may be most famous as the first champion runner from Kenya who paved the way for many of his countrymen to also pursue dreams of world championship running. Keino set the 3,000-meter world record by over six seconds at his first attempt at the distance and won two gold medals in the 1,500 and 5,000 meters at the All-Africa Games in 1965. Later that year, he broke the 5,000-meter world record, and at the 1966 Commonwealth Games in Kingston, Jamaica, he won both the mile and three-mile runs. He won the 1,500-meter gold medal at the 1968 Summer Olympics in Mexico City (defeating American Jim Ryun in a memorable race), and four years later, he won the 3,000-meter steeplechase and 1,500-meter silver medal at the 1972 Summer Olympics in Munich, Germany. In 1987, he was one of seven recipients of Sports Illustrated magazine's "Sportsmen and Sportswomen of the Year" to honor their achievements as "Athletes Who Care" (for his work with orphans), and in 1996, he was inducted into the World Sports Humanitarian Hall of Fame. Although not as accomplished as the previous runners, Jim Fixx, along with George Sheehan, was one of the athletes who put running, fitness, and health, on the map in the 1970s. Like Dr. Sheehan, he turned his life around with running. Before he started running in 1967, he weighed 214 pounds and smoked two packs of cigarettes a day. Ten years later and 60 pounds lighter, he wrote the classic book, "The Complete Book of Running," which sold more than 1 million copies. His books (he wrote seven) and his appearances on television talk shows extolling the virtues of exercise inspired millions of Americans to take up running and fitness for their health. Regrettably, his most dubious honor is that he died of a massive heart attack shortly after a run at the age of 52. The autopsy determined that he had significant narrowing of some of the major arteries in his heart, and it was reported that his father had also died of a heart attack at age 42. There were some who argued as the result of his death that running was dangerous, while others suggested that running added years to his life. But no matter what, he is legendary for putting running on the map and inspiring millions to take it up. According to Drs. Bramble and Lieberman, the researchers who studied running in ancient hunter-gatherers, we all have the genes for running (Bruce Springsteen thinks so too! ); it's just a matter of tapping into them. The first step can be the toughest, but you can do it. And you don't need to be a superstar Olympian like the athletes I mentioned, but let their stories inspire you! Running is healthy and rewarding for just about everyone. Go ahead and give it a try! How has running and jogging benefitted you? Have you experienced injuries from running? What were they?